Hotel Galvez & Spa, A Wyndham Grand® Hotel and National Trust Historic Hotel of America, will commemorate its 100-year reign as “Queen of the Gulf” with a free community celebration on Saturday, June 11. The grounds of this historic Texas beachfront hotel will come alive with family activities and live music during the day and culminate with a fireworks show over the Gulf of Mexico. Hotel Galvez will host a variety of children’s activities such as face painting, arts and crafts, educational exhibits and marionettes and puppeteers on the front lawn and at the hotel’s new Centennial Green outdoor space from 11 a.m. to 6 p.m. The hotel will offer a “Sweet Shoppe” area with candy, cookies, Italian ice and cupcakes in a soda shop-themed tent. Street entertainers will perform on the hotel grounds and five bands will perform live on a festival stage at nearby Beach Central from noon to 9 p.m. The bands include: Judd Johnson Band, Lucky Tubb, Ezra Charles, Wayne “The Train” Hancock and Radiostar. Beach Central will also offer food concessions for the public. For those seeking a souvenir of the weekend, artist Gabrielle McNeese will sign the official Hotel Galvez centennial poster from 1 to 4 p.m. As the day’s activities come to end, the public will enjoy a spectacular fireworks show over the Gulf of Mexico beginning at 9:15 p.m. directly across from the hotel. In addition to the Saturday festivities, The Texas Society Daughters of the American Revolution (DAR) will hold a rededication of the Bernardo de Galvez marker at 10:30 a.m. in front of the hotel. DAR originally dedicated the marker in 1986 for the hotel’s 75th anniversary. The fun will continue on Sunday, June 12 from 1 to 5 p.m. with live music and food at Beach Central across the street from the hotel. Sunday’s concerts are sponsored by Yaga’s Entertainment Inc.
During the month of June, the Hotel Galvez will display a life-size paper Flamenco dress in the lobby. The ruffles of the dress will be made of historic photos of the hotel. 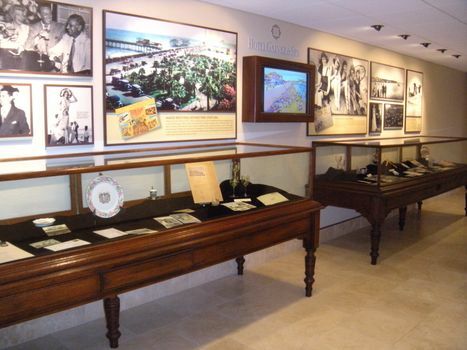 Guests can also explore the hotel’s new Hall of History and pick up a free walking tour booklet for a self-guided tour of the historic Galveston hotel. As part of the centennial weekend, Hotel Galvez is offering a special getaway package. 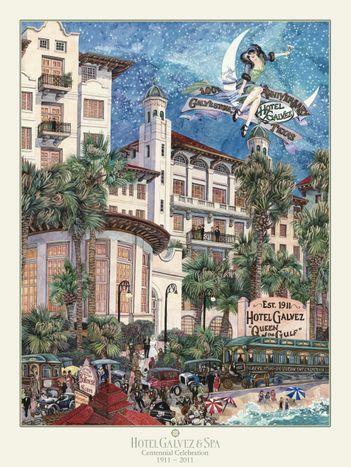 The package includes a two-night stay, valet parking, breakfast for two on Saturday and Sunday, convenient access to the public centennial event activities, a commemorative poster and a keepsake copy of Hotel Galvez: Queen of the Gulf by Gary Cartwright. As part of the weekend, guests will enjoy live Flamenco music and dancers in the lobby from 8 to 10 p.m. on Friday, June 10. In preparation for the centennial, hotel owners George Mitchell and the Mitchell family have completed an $11 million renovation updating all guest rooms with new décor and furnishings and have unveiled the new Centennial Green, an outdoor event featuring a pergola, four charming fountains and, beginning in June, lawn games such as croquet and badminton. Hotel Galvez is a landmark hotel with both historical and emotional significance to many throughout Galveston Island, Texas and beyond. Because of its importance, the hotel launched a yearlong celebration commemorating its 100 years of operation in December 2010. Monthly events will continue through December 2011. A full calendar of events will be available online at www.hotelgalvez100.com. When Hotel Galvez opened in 1911, Galveston had just finished building its 17-foot seawall to protect the island from storm surges; the town had also completed its grade-raising project which raised the grade of land as well as hundreds of buildings from 11 to 14 feet to help protect them from flooding in the event of future storms. The Causeway, connecting Galveston Island to the mainland, had also been completed. These accomplishments were part of the island’s recovery efforts following the Great Storm of 1900. Hotel Galvez, A Wyndham® Grand Hotel and a National Trust Historic Hotel of America, is the only historic beachfront hotel in Texas and is rated four diamonds by AAA and is part of Mitchell Historic Properties. Wyndham Hotels and Resorts, LLC, a subsidiary of Wyndham Worldwide Corporation (NYSE: WYN), offers upscale hotel and resort accommodations throughout the United States, Europe, Canada, Mexico, China and the Caribbean. All Wyndham® hotels are either franchised by the company or managed by Wyndham Hotel Management, Inc., one of its affiliates or through a joint-venture partner. Additional information and reservations for all Wyndham hotels are available by calling (800) WYNDHAM – (800) 996-3426 – or visiting www.wyndham.com. Watercolor artist Gabrielle McNeese created the winning art piece for the hotels commemorative centennial poster. The poster is available at the Hotel Galvez gift shop. 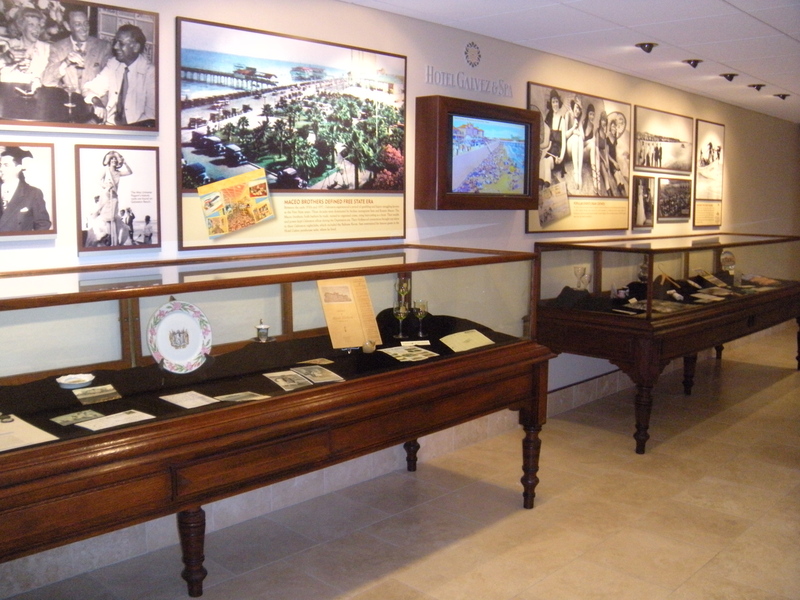 The Hotel Galvez Hall of History features display panels covering the history of the hotel as well as display cases featuring various items.